So, Christmas is just around the corner and I had this great idea... it all came about after Sadie brought home a book from book mobile called "The Christmas Memory Quilt." Cute story with a great message about a little girl who learned to sew with her Grandma. She would sew the squares of fabric into long strips and her Grandma would sew the strips together, it also had a pattern on the back of the book. 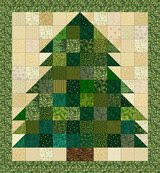 I decided to sew a quilt with Sadie similar to the one in the book it's a Christmas Tree Pattern, pretty simple, blocks sewn in strips to make a simple christmas tree out of green scraps. I am very excited about the idea of doing it with her and so it will be something we pull out every year for her to put on her bed during the holiday season. It would be fun to do one every year for the boys too. Here is a rough idea of what the pattern will look like... only pinks and reds behind the tree. Oh goody.... a project, I can't wait! You are such an amazing mom! Good luck! I want to see a picture when you're done!!! I wish I had your enthusiam. Your kids are LUCKY! 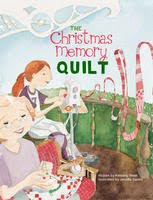 How about a Christmas Memory Quilt with your SISTER! I am jealous of Sadie. Sounds so fun!